Our Russian Hill Nest located in one of San Francisco’s most dynamic and tourist friendly neighborhoods, offers all that anyone can ask for in a short term rental. The home is a short walk to the cable car, and the Polk Street and Union Street shopping and entertainment districts. 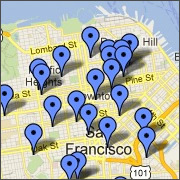 Fisherman’s Wharf, Chinatown and North Beach are also located near the Russian Hill Nest. The well cared for and comfortable home is a delight. As you enter the home you will find the tasteful living room to the right. Adjacent to the living rooms is a full dining room. The kitchen, though not large, has all modern conveniences and amenities. The hallway off the living room leads towards the rear of the home. Just off the hallway are the bathrooms which are split as a WC (toilet) and sink and bathtub/shower in a separate room. At the rear of the home are the two bedrooms with spectacular views of the urban landscape. There is also a very pleasant roof top deck (shared by the building) with absolutely tremendous views, including a full panorama of the Golden Gate Bridge. The Russian Hill Nest is located near any number of public transport options and there are numerous restaurant and shopping options within two of three blocks of the home. Make your next stay a pleasant and comfortable one at our Russian Hill Nest.